This is the time of year everybody is on edge because everybody is trying to get in final assignments and cram for exams. But on Monday May 9th, students got a little break from all of the chaos and celebrated Student Appreciation Day. 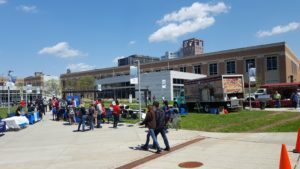 Two pizza trucks were parked out in the grassy area of the campus and served free freshly baked pizzas. These pizza trucks came from a pizzeria called EST Pizza, which is a popular restaurant in the New Haven area. All around the campus students had fun playing games and enjoying the food. Final exams are a stressful time for students but it’s nice to get a day all about students for a change. On that beautiful spring day students were smiling and rejoicing in the warm weather and enjoying the free pizza. After all, this event is what HCC is all about. We are a community of students that are very different from one another but at the same time we are united as one. Student Appreciation day was very important for students because it gave them something to look forward to before having to tackle the final exams for their respective courses.